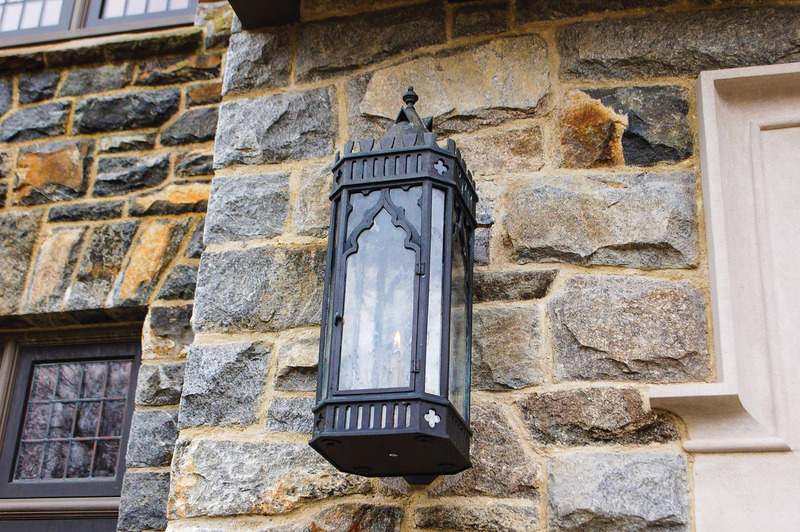 Though electrified, the ‘New Haven’ wall sconce from Lanternland has a portable look. 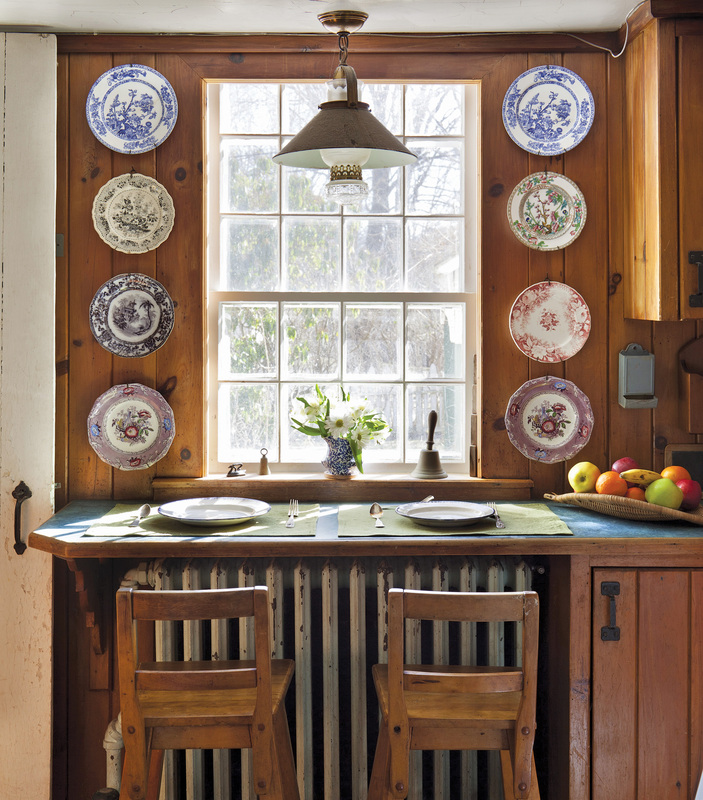 Farmhouse-style has become a catchphrase in design jargon, one that covers the ubiquitous (and British) apron-front sink, trestle dining tables, and flour-sack kitchen linens. 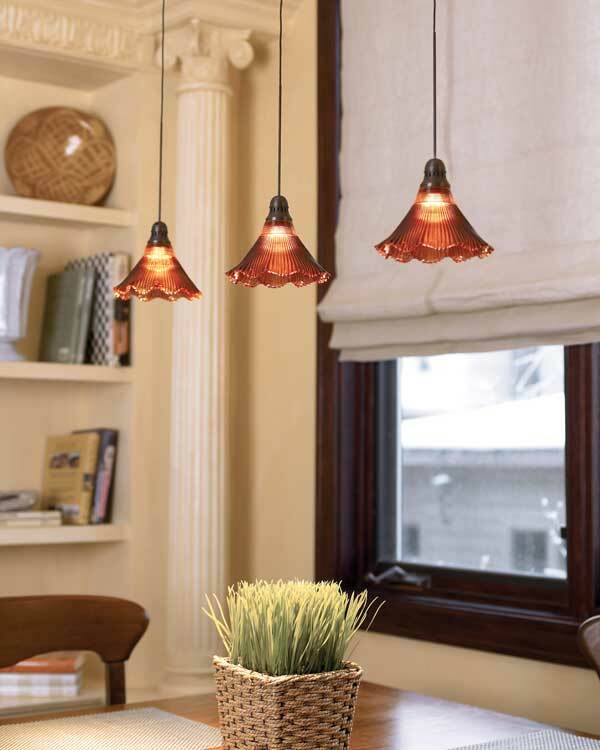 The trend is nowhere as prevalent as in the current crop of lighting fixtures; those crafted from washtub aluminum and mason jars are everywhere. While such fixtures are clearly inspired by the simple, rustic lights found in rural farmhouses, it’s worth pointing out that neither aluminum nor manufactured glass jars were available during most of the 19th century, when the old farmhouses presumably were built. Restorers are looking for something more authentic. 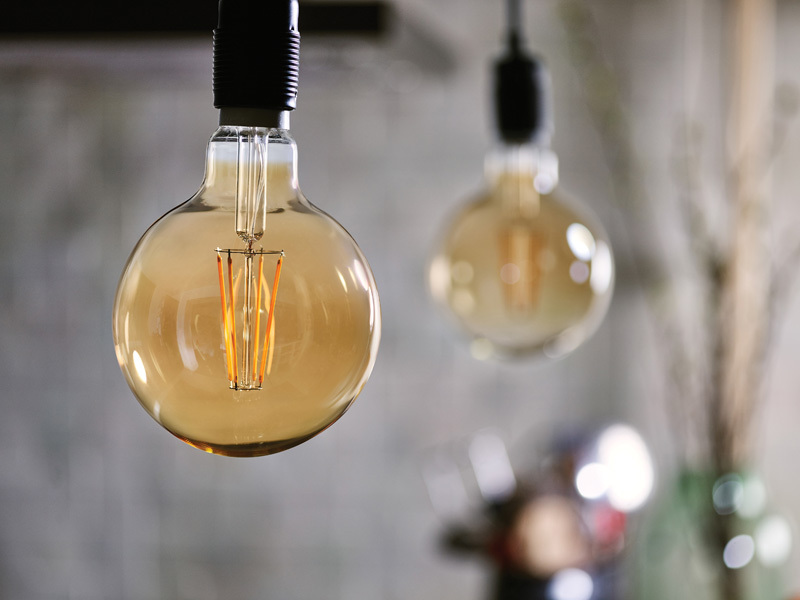 Like everything else in the pre-Industrial era, most light fixtures were fashioned from readily available materials: wood, tin, wire, and various kinds of glass, from clear to seedy to frosted. Fancier treatments included painting in the earth-colored pigments of the day, including milk paint. Later, after the advent of whale oil, “fixtures” had glass or metal reservoirs for the oil, and rounded inverted shades to amplify light. 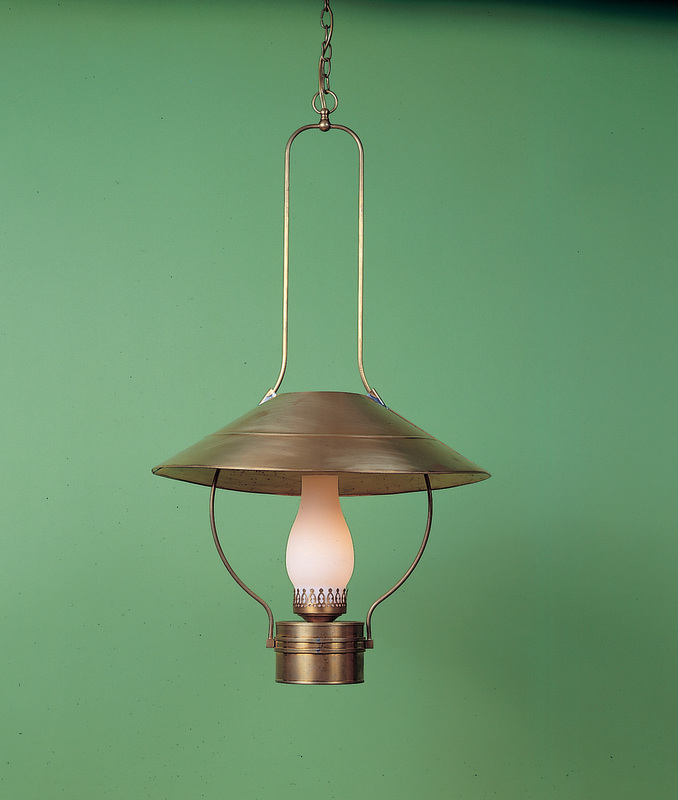 A kerosene or whale oil-style reproduction lamp suggests farmhouses of many eras. Earlier lighting was considered portable, so any modern reproduction should suggest that simplicity. Many sconces, for example, were just a step up from an open-flame candle, backed by a circular or square sheet of tin so highly polished you could see your reflection. The most common “pendant” was probably the lantern, which moved from indoors to outdoors (to be hung from a hook) at a moment’s notice. As for chandeliers, few farmhouses laid claim to the brass-armed or crystal-draped beauties enjoyed by city dwellers of wealth and distinction. 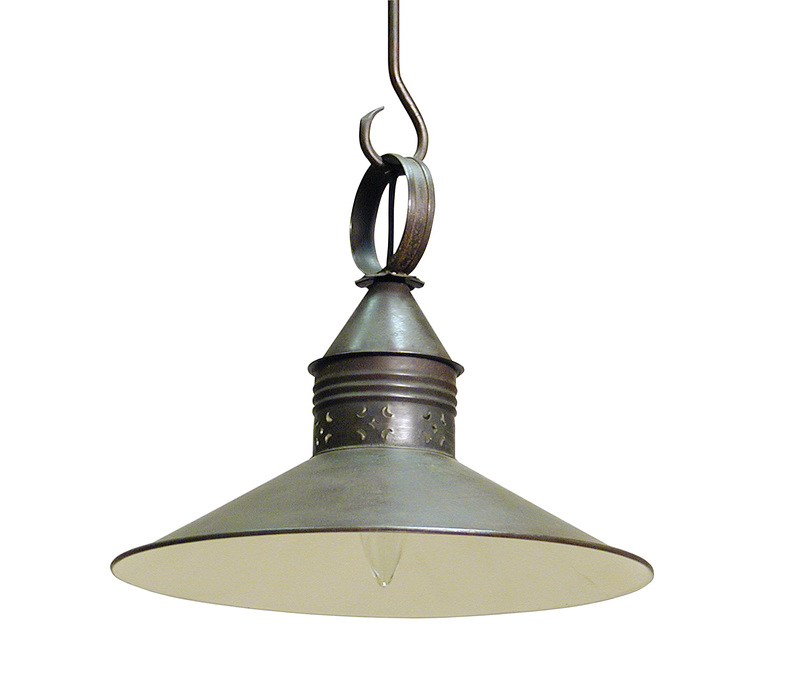 A more authentic choice for pride-of-place farmhouse lighting is a chandelier with an inventively shaped wood or tin body. Resulting in some of the finest examples of early American folk art, most of these “quintessentially Colonial” designs actually probably date to the early 19th century. A reproduction double-cone wire chandelier complements a farmhouse dining room furnished with a mix of antiques and reproductions. Early wood bases were shaped on a lathe, producing turnings similar to balusters. The most typical have a rounded or bulbous shape that visually anchors the base—a ball or acorn shape, for example. 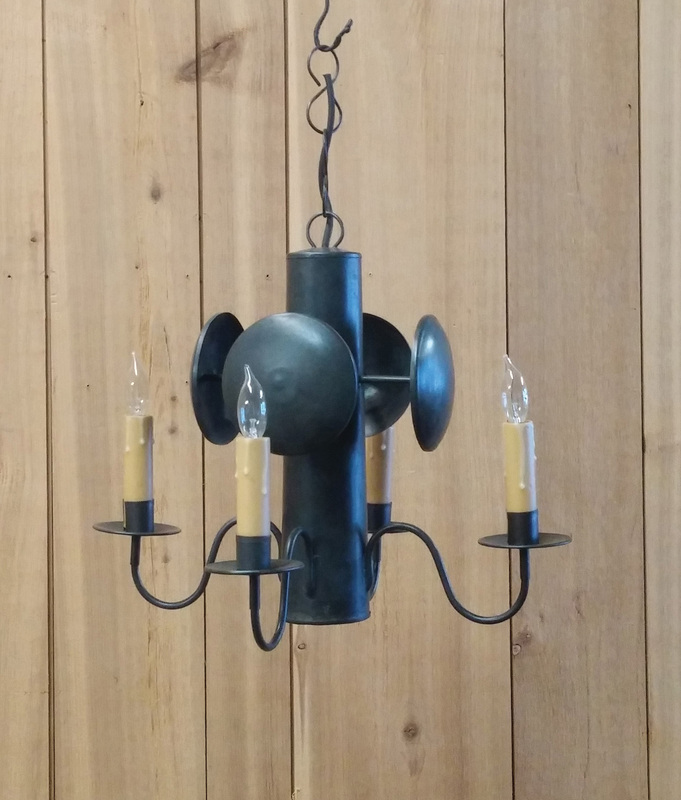 Both wood and metal chandeliers typically were finished with tinned sheet-metal arms or S-shaped, rounded, or flaring wires. Even when made from modest materials, however, grand, multi-tiered chandeliers were likely intended for larger-scaled interiors such as churches and meeting halls. Single-tier chandeliers with as few as three arms are more in scale with farmhouse keeping rooms and kitchens. The centers of predominantly metal chandeliers tended to be less sophisticated in shape than those in wood, ranging from simple rectangular posts with or without reflectors to inverted “witch’s hat” cones. Metal can be punched, chiseled, painted, or distressed in imaginative ways, especially with sunbursts and other dramatic patterns popular in the early 1800s. Whale-oil and kerosene fixtures inevitably had a gracefully shaped glass or metal reservoir. Shades for these later lighting devices ranged from simple burnished or lacquered metals to hand-painted and etched glass. 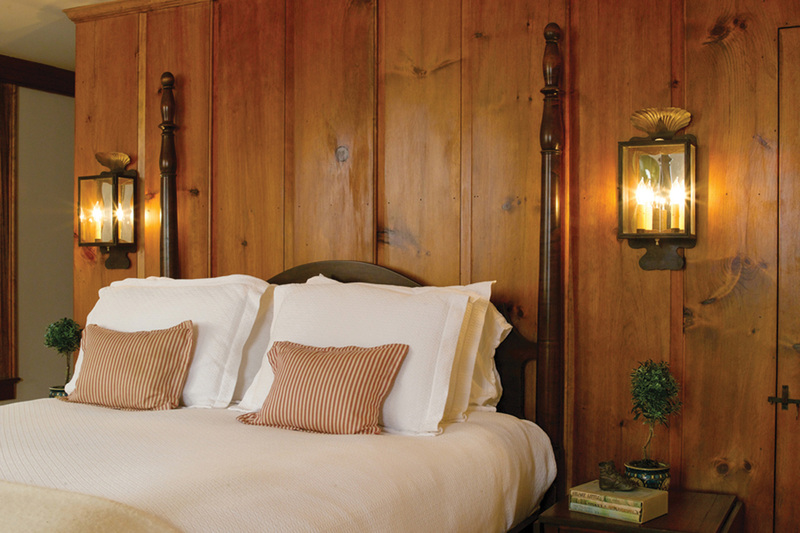 A pair of ‘Smoke Screen’ box sconces from Classic Lighting Devices is shown in a bedroom with wall paneling. 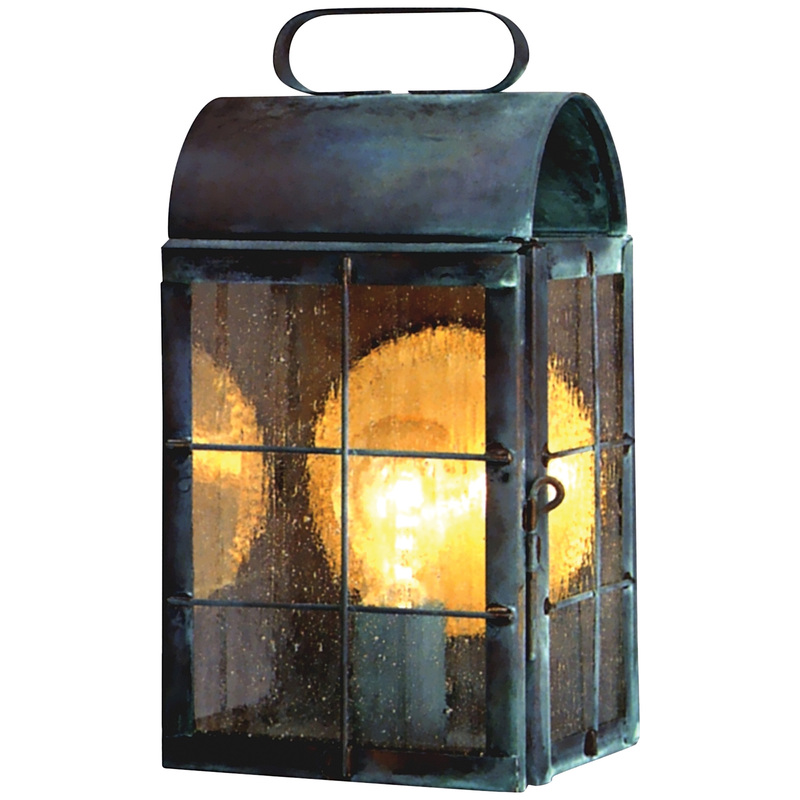 Modern reproductions of Colonial-era metal fixtures are offered in a range of finishes, from tin and copper to darkest black, often patinated to suggest great age. With the same aim, wood fixtures may be layered with up to 15 or 20 coats of paint and varnish for a distressed effect. For a truly authentic look, seek out fixtures with characteristics that suggest handcraftsmanship, including the use of period tools or techniques. For instance, a wood center that is cut on a hand-cranked lathe will display more variation than a machined one. Handwork involved in a finish—multiple layers of paint, with sanding in between, for instance—will result in a fixture that stands out above production pieces. Details matter: Look for slight variations on crimped candle mounts, for example. If they all look the same, it’s a sign that they are die-stamped and not handmade. 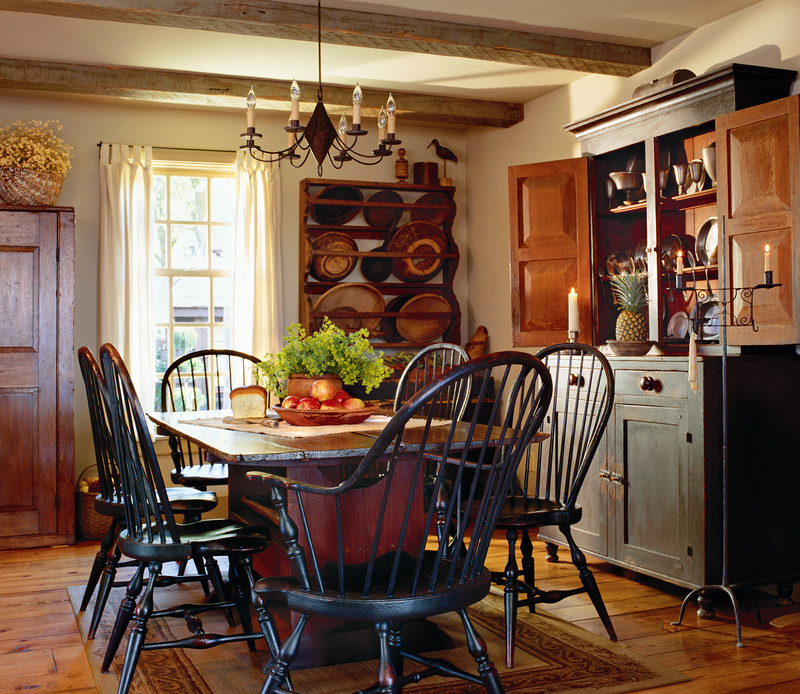 For a farmhouse look that transcends much of American history, consider lights that offer a little of everything, from distressed metals or wood to a hand-painted or -punched finish on the shade.